According to a recent study released by Johns Hopkins, “never” events–events that should never happen during surgery– occur approximately 4,000 times a year in the U.S. Retained foreign bodies, such as a sponge or surgical instrument being left in a person’s body occurs about 39 times per week. Surgeons perform the wrong surgery or procedure 20 times per week, and the wrong site or wrong patient is operated on about 20 times every single week. This shocking data comes on the heels of recent research that found that approximately 440,000 U.S. deaths are caused by preventable hospital errors each year, and millions of people are injured annually as a result of preventable medical mistakes. In addition, recent studies show that when physicians make mistakes, other physicians and medical personnel rarely report the errors. One study found that 86% of all medical errors that occurred were never reported. Even more shocking is the fact that when physician mistakes actually are reported and a hospital revokes or restricts physicians’ clinical privileges, state medical boards seldom take any disciplinary action, which means the offending physicians’ medical licenses remain intact and the physicians are free to practice anywhere in their state of licensure. Indeed, many lethal errors occur when a patient undergoes diagnostic testing, medical procedures and surgery. In addition, medication errors also are causing a large number of fatalities. A study by the Institute of Medicine found that approximately 30 percent of all medical procedures, tests and medications may actually be unnecessary. During the last 2 years, the American Board of Internal Medicine Foundation has released reports on the most overused tests and treatments that provide limited or no benefit at all, or cause more harm than good to the patient. The list currently includes 135 tests and treatments. In fact, a report by the Mayo Clinic found that somewhere between 40 and 78 percent of all medical tests, treatments and procedures are of no benefit to patients and can actually harm them. Other errors that cause preventable deaths in patients include diagnostic errors, errors of omission and failure to follow guidelines. A panel of patient safety experts told the senate last week that hospitals are no safer now than they were 15 years ago, which is when the alarming data about preventable hospital deaths and injuries was first brought to light. In fact, this research has been discussed at length in the media and during congressional hearings. Yet, studies also show that hospitals and legislators are not taking any meaningful action to curtail this epidemic of preventable medical error. With so much inaction on the part of hospitals and regulatory bodies, it is crucial for patients to play an active role in their treatment. We have written several pieces on how to stay safe during a hospital stay. This is especially important when the hospital stay involves both the mother and baby. A recent study from the Centers for Disease Control (CDC) found that giving birth is now much riskier than it was in the decades prior to the year 2000. Listed below are some steps expecting mothers can take to help ensure a healthy pregnancy, labor and delivery. Will my baby have continuous electronic fetal heart rate monitoring? Is there at least one other person involved in my labor and delivery that is skilled at fetal heart rate tracing interpretation? If my baby becomes distressed, do you have the ability to deliver her very quickly by emergency C-section? Is there proper resuscitation equipment immediately available in case my baby needs to be resuscitated right after delivery? WHAT ARE SOME COMPLICATIONS THAT CAN OCCUR DURING LABOR AND DELIVERY? It is the standard of care to continuously monitor the baby’s heart rate when the mother is admitted to the labor and delivery unit. Sometimes, the medical team monitoring the mother and baby are not properly trained in interpreting the fetal heart rate tracings. Other times, there is a breakdown in communication and the physician is not contacted quickly enough or the physician does not respond fast enough to communications regarding a baby’s distress. When a baby is in distress, it almost always means she is suffering from a lack of oxygen in her brain, and this can cause permanent brain injury if prolonged. If a baby’s distress cannot be instantly remedied, the physician must deliver the baby right away, often by emergency cesarean (C-section) delivery. If the distress is severe and a baby cannot be vaginally delivered in a safe and timely fashion, a C-section must quickly be performed. Indeed, getting the baby out of the womb is the only way to directly help her and give her oxygen and other critical treatments, such as resuscitation. Often, there is no time to try and remedy distress and a C-section is required. Failure to quickly deliver a baby by C-section when she is in distress can cause her to have permanent injuries, such as hypoxic ischemic encephalopathy (HIE), seizure disorders, cerebral palsy, intellectual and developmental disabilities and periventricular leukomalacia (PVL). If your child was diagnosed with a birth injury such as cerebral palsy, hypoxic ischemic encephalopathy (HIE), seizures or Erb’s palsy, Jesse and his award winning team can help. 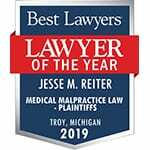 The attorneys at Reiter & Walsh aggressively fight to obtain compensation for the lifelong treatment, therapy and secure future that each child deserves. 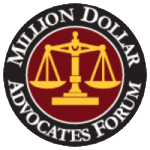 The firm has numerous multimillion dollar verdicts and settlements that attest to its success and no fees are ever paid until your case is won. Email or call Reiter & Walsh ABC Law Centers at 888-419-2229 today. Our award winning attorneys are available 24 / 7 to speak with you.